With reliable 2.7 V vacuum light source for good illumination of the examination area. Quick-to-remove lamp at the front of the blade. Can be autoclaved at 134° C for 5 minutes. Stainless steel blades with easy-to-clean blade surface. 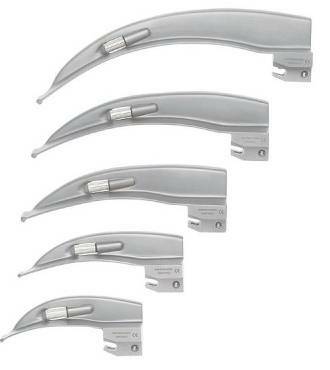 Innovative blade design for simple intubation and good visibility. Either for chargeable handles or battery handles type AA or type C for charging in the ri-charger® charging base or non-rechargeable. All blades are compatible with handles complying with ISO 7376. Hard and soft cases are available for individual combinations of up to five blades and one handle.